Hostmysite.com :: How do I disable Spam filtering in SmarterMail? How do I disable Spam filtering in SmarterMail? 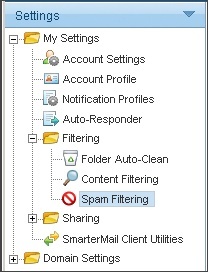 The following article explains how to disable the Spam filtering feature in SmarterMail. The default settings are to add SPAM-LOW, SPAM-MED or SPAM-HIGH to the subject line of emails considered to be Spam. To have email delivered as normal without the default Spam filter, the filter settings must be overridden and set to take no action. Expand Filtering and select Spam Filtering. On the Actions tab set each Action to No action. If you would like to create your own filters that scan the contents of your email, you can create Content Filters based on Spam Probability. 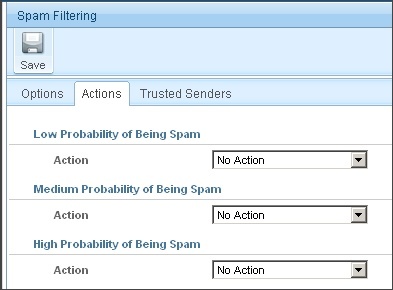 To create these filters, follow the steps of our email filtering support article.